"I use Indian River pink grapefruit. Serve with whipped cream." Combine the sugar, cornstarch, and 3/4 cup juice in a small saucepan; if the collected juice does not measure 3/4 cup, top it off with water. Bring to a boil. Stir in strawberry gelatin. Cool slightly. 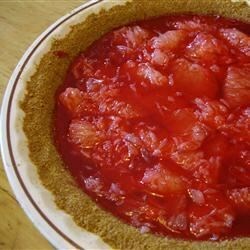 Spread grapefruit in the bottom of the baked shell, and pour gelatin over the fruit. Chill several hours or overnight.